Should I Release my Medical Records to the Other Ins Co? After a motor vehicle accident you can count on the other driver's insurance company calling you and mailing you documents to sign and return. One of the documents will be an Authorization to Release your Medical Records. 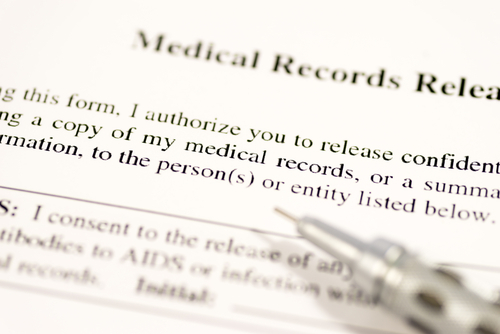 A question we hear often is: "Should I sign the Medical Records Release that the insurance company mailed me?" The simple answer is NO. The other driver's insurance company will, without question, try to contact you soon after the accident. They will call you in order to try and get a statement from you. They will also mail you letters with documents, including a Medical Records Release or Authorization to Release Medical Records, for you to sign and return to them. They do this quickly after an accident in hopes of getting the injured party to give them a statement and sign the Release before he or she speaks with an experienced personal injury lawyer. Why? Because they know that if you speak with a qualified and experienced accident attorney first, you will be advised not sign and return the Release and not to give the other driver's insurance company a statement. The reason they want you to sign the Release is so they can obtain all your past medical records. A Release with no time limitations will allow the other driver's insurance company to obtain any and all of your medical records. They do this so they can dig into your private life for evidence of similar injuries or complaints to downplay the extent of the injuries sustained from the car accident or claim that the injuries you suffered in the accident were pre-existing. With prior medical records, they hope to create an issue with regard to your injuries in order to offer you less money in the end and save money for their insurance company. Have you Been Injured in a Motor Vehicle Accident in Massachusetts? If you have suffered injuries in an auto accident in Massachusetts, you may be entitled to financial compensation. You probably have many questions like the one above. If so, feel free to call us at (508) 879-3500 or contact us online to schedule a complimentary meeting and case evaluation. We will explain to you what your legal rights are and how we can best help you. Can I still collect workers’ compensation benefits if the accident was my fault? Yes. In Massachusetts, the Workers’ Compensation Act is a “no fault” system that is in place to make sure that workers are covered and protected by insurance in case they are injured on the job. Massachusetts workers’ compensation benefits are referred to as “no fault” benefits because, regardless of whose fault the accident was that caused the employee’s injuries, the injured worker is still entitled to workers’ compensation. This is true even if the injured worker caused the accident himself or herself. For example, we previously represented a roofer, who fell approximately 15 feet from a ladder and injured his leg. Although the fall from the ladder was completely the employee’s fault, he was still entitled to and did collect workers’ compensation for his injuries. In another case, a personal care attendant (PCA) was driving a patient to the store and failed to pay proper attention to traffic and rear-ended the car in front of him. The PCA was injured and, even though the accident was his fault, he was still able to collect workers’ compensation. Now, don’t confuse this with a personal injury case (i.e., motor vehicle accident or slip and fall). In those cases, the injured person must establish that the other driver, property owner or other third party was negligent and that their negligence caused the injuries. If you were injured while in the course of your employment you can collect workers’ compensation, even if you were at fault. Have You Been Injured on the Job in Massachusetts and Unsure Whether You Can Collect Workers’ Compensation? If you have been injured while in the course of your employment in Massachusetts and are unsure whether you can collect workers’ compensation or have questions about your rights, please call us at (508) 879-3500 or contact us online to set up a time to speak with our legal team. We will take the time to evaluate your case and answer your questions. This meeting is free and might be the best decision you make. Arbitration is a form of “alternative dispute resolution”, which offers parties to a personal injury case or accident case an alternative way of resolving their case. It’s an alternative to a trial. In most situations an arbitration can be an efficient and cost effective method of resolving a case. Rather than going through a prolonged trial with the uncertainty of a jury or judge, the parties can agree to arbitrate their case. There are three important aspects of arbitration that should always be considered. One, both sides have to agree to arbitrate the case; Two, the parties must agree on which arbitrator(s) will be used; and Three, and most importantly, the arbitrator’s decision is final. Arbitration is a great way to resolve a personal injury case, but may not be appropriate for all cases. An experienced personal injury lawyer should be consulted before making a decision to arbitrate. Have You Been Injured in an Accident in Massachusetts? If you have suffered injuries in an accident in Massachusetts, you may be entitled to financial compensation. You most likely have many questions about your legal rights and options. If so, feel free to call us at (508) 879-3500 or contact us online to schedule a complimentary meeting and case evaluation. We will explain what your legal rights are and how we can best help you. Mediation is a form of alternative dispute resolution for legal claims and cases. It is a voluntary process that parties to a legal dispute can agree to in an attempt to resolve the dispute. For example, if a person is injured in a car accident case and the other driver’s insurance company claims the injured person was at fault, the two parties can agree to mediate the case to resolve the dispute. If the parties to the dispute agree to mediate the case, they will select a mutually agreeable mediator. Mediators are usually former judges or lawyers that are experienced in a certain area of law. For instance, in a dispute regarding liability of a car accident, the parties will usually want a mediator that is experienced with car accident cases and injuries. The mediation is an informal process where the parties and their lawyers will meet at an office with the mediator. The parties and the mediator will begin the mediation in one office and both parties will have an opportunity to present a brief summary of the facts of the case, legal issues and the claims and defenses. Next, the parties will split up and go to separate offices or rooms. The mediator then will go back and forth between the two rooms and explain the realistic expectations of the case to the parties based upon his/her experience and view of the case. The mediator will attempt to bring the parties to some middle ground to help resolve or settle the case. Mediation is not binding upon the parties, which means if either party is not satisfied with the mediator’s recommendations or result of the mediation, they are not constrained by the mediation and can continue to litigate or pursue their other legal options. I always hear about commercial trucking accidents. What exactly is a commercial truck? Commercial trucks are large vehicles used in the course of a business to transport products or goods. We have all seen these trucks on the highways or roadways in Massachusetts. They are the tractor trailers, eighteen-wheelers, delivery trucks (i.e., FedEx, UPS, etc…) or other commercial constructions trucks like dump trucks, cement mixers and the like. Most of the commercial trucks require a special license known as a CDL (commercial driver’s license) to operate these large trucks. Some businesses even have pickup trucks registered as commercial trucks. These vehicles are extremely large and commercial trucking accidents cause catastrofic and potentially fatal crashes. They usually carry a different insurance policy for bodily injury and property damage. The commercial insurance policies generally offer more coverage because of the danger and risk of serious injury in the event of a commercial truck crash. Do You Have Other Questions About A Trucking Accident? Mahaney & Pappas, LLP specializes in representing accident victims, including those injured in truck accidents. Our mission is to get the maximum financial compensation for our clients for the injuries, damages and losses they suffered. If you or someone you know has been injured in a truck accident, please contact us online or call (508) 879-3500 for a free meeting to discuss your claim. What can I do if I am denied workers’ compensation benefits in Massachusetts? If you are injured on the job in a work accident and the injury prevents you from working, your employer’s workers’ compensation insurance carrier has the option of voluntarily paying you disability benefits or denying the claim. In some situations, the workers’ compensation insurer will deny a claim or the employee may never receive any notice from the insurer or his or her employer. If an injured worker receives a denial from the workers’ compensation insurer then the injured employee can take legal action and file an Employee's Claim for benefits. If the injured worker never hears from or receives any documentation from his or her employer or workers’ compensation insurer, then after the expiration of thirty days from the injury, the employee can file the Employee’s Claim for benefits. The Form 110 Employee’s Claim is the document that must be prepared and filed with the Department of Industrial Accidents in Massachusetts along with medical or other documentation establishing the causal relationship between the injury and work accident and medical evidence that the employee’s injury renders him disabled and unable to work. When the employee files a claim, he or she is taking court action to have a judge force or order the workers’ compensation insurance company to pay disability benefits and medical benefits. I was hurt on the job and have to go to many doctor's appointments. Can I be reimbursed for mileage? Does my employer have to agree to my Lump Sum Settlement? Yes. An employer must approve a Lump Sum Settlement, with some limited exceptions. If the injured worker and the workers’ compensation insurer reach an agreement to resolve the claim by way of a lump sum settlement, then the proposed settlement will be presented for approval to a judge of the Department of Industrial Accidents at a Lump Sum Conference. Aside from the other required documents to be presented at the Conference, the workers’ compensation insurance company or their attorney will file the Consent of Employer to Lump Sum Settlement, which is a designated form known as Form 116A. Have You Been Hurt in a Work Place Accident in Massachusetts? Is the Surviving Spouse of a Fatally Injured Worker Entitled to Workers' Compensation? In Massachusetts, if an employee is injured in a work related accident that results in the employee's death, the surving spouse of a fatally injured worker may be eligible for workers' compensation benefits. The benefits include reimbursement of burial expenses up to $4,000 and weekly death benefits. The weekly death benefits are governed by Massachusetts General Laws, Chapter 152 Section 31. Section 31 provides that the surviving spouse may be eligible for weekly workers' compensation benefits equal to two-thirds of the deceased worker's average weekly wage, but no more than the state's average weekly wage (SAWW) set by the Commonwealth of Massachusetts and in effect at the time of the injury or death. The total payments of death benefits to the surviving spouse shall not be more than the SAWW multiplied by 250. If the surviving spouse remarries, all death benefits from workers' compensation shall terminate. Have You Lost a Loved One in a Work Accident in Massachusetts? If you have lost a loved one in a work related accident in Massachusetts, there may be workers' compensation benefis available. Please call us at (508) 879-3500 or contact us online to set up a time to speak with our legal team so we can evaluate your case for free. It just might be the best decision you make. If I am bitten by a dog, is the dog owner covered by insurance? When we meet with people, who have been bitten and injured by someone else's dog or other pet, they usually ask if there is any insurance that would cover their injuries and losses. Generally, the dog owner's home owner's insurance policy would cover any damages caused by their dog. Remember, Massachusetts follows a strict liability standard for dog bite cases. The dog owner, therefore, may be held liable and legally responsible for the damages his or her dog causes, even if the dog owner is not necessarily negligent. Generally, damages are the only matter at issue and the home owner's insurance policy will normally cover the damages. If you, or someone you know, has been bitten by a dog, you should seek legal advice and guidance about how you can pursue financial compensation for your injuries and losses. At Mahaney & Pappas, LLP, we have handled numerous dog bite cases and are here to help you recover the money you deserve. Call us today at 508-879-3500 or contact us online to schedule your free consultation. We offer contingent fees on dog bite cases. This means, you don't pay us until and unless you recover compensation.